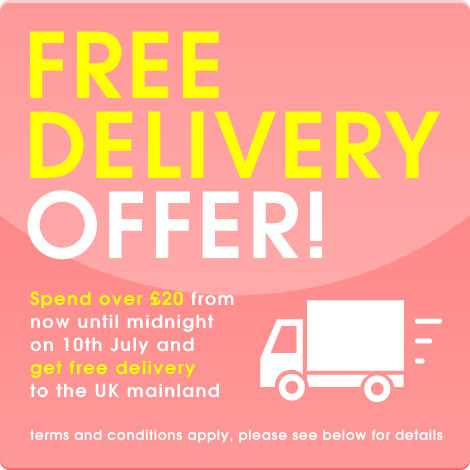 • This offer is only valid for orders received from 6:00pm Wednesday 6th July to 11:59pm Sunday 10th July. • Only orders with over £20 of items in the basket are eligible for free delivery. Packaging fees are not considered part of this £20 total. • This offer applies to both Royal Mail and courier service delivery options. Any Royal Mail orders with a delivery charge cost over £4.95 will automatically be upgraded to DPD courier service. • All free deliveries will be delivered by our standard next day courier service and arrive with you the following working day after dispatch. This does not include deliveries for 9am, 10am, 12pm, Saturday deliveries or any orders with chilled items. • This offer is only applicable for regular orders and does not cover any orders with chilled items in it.